Lee Armstrong's conversion helped give Hawick a half-time lead. Picture: SNS/SRU. Hawick played their now familiar card of scoring in injury time to achieve a vital win over Glasgow Hawks that hoists the Greens into a safer zone in the table. 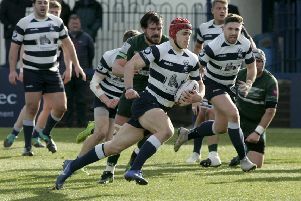 On a grey day, mirrored by the performances of both sides, it was the power of the Hawick forward pack and the confidence derived from their win over Heriot’s that produced victory against a penalty-prone Hawks. Hawick had a slender lead at half time when they led 7-5 from a rolling maul try by Matt Carryer, converted by Lee Armstrong, to an unconverted try for Hawks by second row Fraser Hastie in first-half injury time after umpteen phases of play. Hawks stepped up the tempo in the second half and after Paddy Boyer had broken clear Calum Kerr cruised over for his side’s second try, this time the conversion attempt by Ross Thompson succeeding. In the final stages Hawick gained control of the scrummaging battle, resulting in the loss to the bin of Hawks’ Jake Eaglesham and, more importantly for the Greens a penalty try to win the match.